When water freezes into ice, the water molecules stack together to form a regular crystalline lattice, and the ice lattice has six-fold symmetry (see the Primer). It is this hexagonal crystal symmetry that ultimately determines the symmetry of snow crystals. But then one must ask how molecular forces, which operate at the molecular scale to produce the crystal lattice, can control the shape of a snow crystal some ten million times larger. The answer to this has to do with how crystals form facets. Facets appear on many growing crystals because some surfaces grow much more slowly than others. If we imagine beginning with a small round ice crystal, then mostly we would find that the surface was quite rough on a molecular scale, with lots of dangling chemical bonds. Water molecules from the air can readily attach to these rough surfaces, which thus grow relatively quickly. 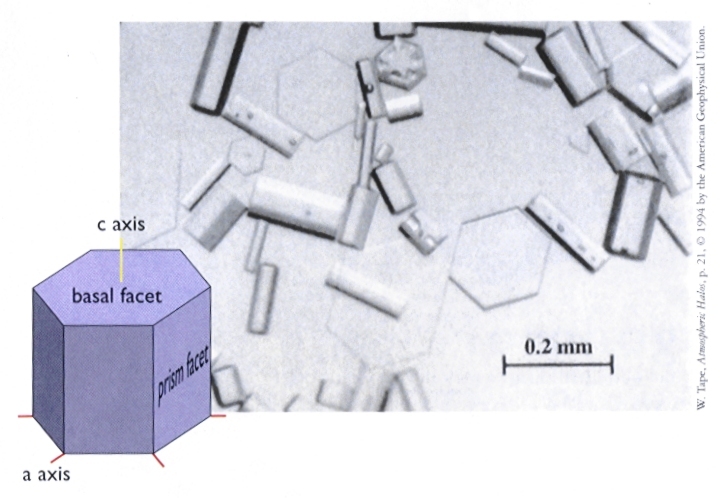 The facet planes are special, however, in that they tend to be smoother on a molecular scale, with fewer dangling bonds. Water molecules cannot so easily attach to these smooth surfaces, and hence the facet surfaces advance more slowly. After all the rough surfaces have grown out, what remains are the slow-moving facet surfaces. The picture at right shows the idea for a crystal with four-fold symmetry (which is easier to draw). Faceting in snow crystals produces hexagonal prisms like the ones at left, which are the simplest form of snow crystals. These specimens were collected at the South Pole by Walter Tape (see Photos), where the crystals grow very slowly, allowing the facets to fully develop.